He's currently in Vancouver, Canada, filming the science fiction series See. 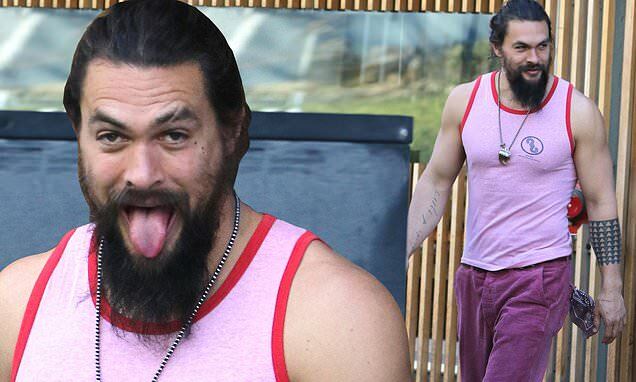 Jason Momoa was spotted leaving Marutama Ra-men after grabbing some noodles for breakfast with his buddies. The 39-year-old Aquaman star couldn't help but show off his famous physique in a striking pink tank top. The former Game Of Thrones star's pink shirt with red trim put his well-muscled biceps and tattoos on display. He channeled another DC comics fixture, The Joker, with his purple corduroy pants. The bearded action star playfully stuck his tongue out as he departed the restaurant with his friends. The Frontier star filmed a series of short videos during the morning food stop. 'Ok so I have a small addiction,' he says as he enters the intimate ramen shop. Jason was gleeful as the waiters brought out the steaming bowls of noodles and soup. He was spotted visiting the same spot last week.